Well, after sharing the list of items with Abby, she thoughtfully looked at me and responded by reminding me why we do the work we do in the first place, the gift of being fully present to those we love and the power of returning from a break actually rejuvenated to do the work. She then stood up and offered a final piece of advice: "Leave it all behind." For two weeks, instead of writing articles for publication, I went on walks with my wife, shot baskets with my boys and baked pies with my daughter. Instead of recording videos of me speaking, I recorded videos of my family gatherings, friends at parties and kids opening presents. Instead of writing hundreds of thank you notes to clients, I wrote a few sincere love letters to dear friends. 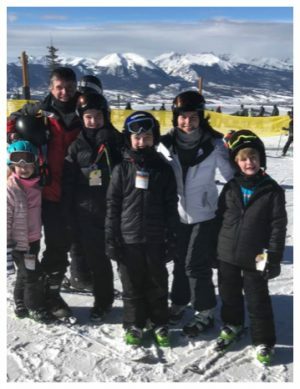 And instead of disappearing into coffee shops and quiet nooks to write a chapter recalling memories from the past, we surprised our kids with a ski trip to create new memories to last a lifetime. My friends, don't read the above as permission to procrastinate for our entire lives. Don't ignore important work projects of the day. Don't burn that to-do list of tasks to accomplish. Don't stop striving to succeed mightily. Hard work, professional growth and personal progress are important aspects of a meaningful life. As you sweep up the holiday parties, put away the Christmas decorations and return to the worthy work of your life, remember to occasionally take pause. Although some people believe holding on and hanging in there are signs of great strength, the truth is that there are times when it takes much more strength to know when to let go. And then to have the courage to do it. In the mundane periods of each day, the stress of the task, or the disappointments of the season, it's critically important to return to what matters most, give thanks for all we already have, control the things we can and then leave the rest behind. Because, in the end, that's where you'll leave it anyway. As you start your 2019 New Year, please take a moment to subscribe to the Live Inspired Podcast. Join me and more than 1,000,000 others who have been inspired by our remarkable guests, including such luminaries such as Brene Brown, Mitch Albom, Dave Ramsey and my incredible mother, Susan O'Leary. Listen weekly and you'll become a much better version of yourself this year! The post Leave It All Behind appeared first on John O'Leary.